Gary Edgley said it wasn’t a good day at the office for his inexperienced Boston Town squad following Saturday’s 4-1 defeat at Newport Pagnell. After getting their first win of the season last weekend and knocking Peterborough Northern Star out of the UCL Knockout Cup in midweek, things were looking up for the Poachers. But the Swans had too much to offer in Buckinghamshire despite Dom Goddard’s consolation. “Not a good day at the office for Boston Town,” Edgley said. “But travelling two hours away with seven first-choice players missing against a decent UCL (Premier) team is asking a lot of the lads that did play today. Town have been handed a tough draw in the second round of the Kitman UCK Knockout Cup. Their reward for knocking out Peterborough Northern Star is a trip to high-flying Eynesbury Rovers. The last 16 tie is scheduled for Tuesday, October 30. Town recenly lost 5-0 to Eynesbury. 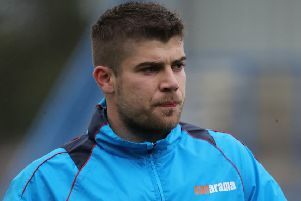 Town have bolstered their ranks with the arrival of defender Daniel Moulds, who arrives on a season-long loan from Spalding United. The former Boston United youth teamer is seen as the natural successor to Simon Ashton, who has joined Skegness Town. On Saturday the Poachers return to action away at Wellingborough Town. Kick off at the Dog and Duck will be at 3pm.